Local students will be in a battle of the brains as they try to outdo each other to come up with technological solutions to real-world challenges today. 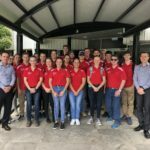 About 50 students from Anglican Church Grammar School (Churchie) and Somerville House will be mentored by minerals and energy professions through engineering challenges around oil and gas wells and minerals sorting. It’s the first Queensland Minerals and Energy Academy (QMEA) event hosted at Churchie and the first time Somerville House students have taken part in the Beakers.Bots.Build (BBB) workshop. The industry mentors will also provide insights into their own study and career pathways to help students select their own career pathways. 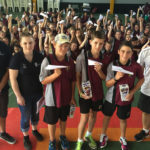 “These are brand new activities in our BBB workshops, designed to join the dots between classroom learning and its use in the real world,” said Katrina-Lee Jones, Director Skills Education and Diversity with the Queensland Resources Council (QRC). “It’s also important for students to understand the many career choices that can follow their science, technology engineering and science (STEM) studies,” she said. “We are very proud to support this outstanding program, and the results speak for themselves,” said James Palmer, Asset President of the BHP Mitsubishi Alliance. “It’s critical for students to experience the practical application of their classroom studies, while learning about the range of exciting career opportunities that STEM-related subjects can lead to in mining,” he said. “We’re delighted to be hosting the students from Somerville House for this challenge and look forward to some great inter-school competition,” said Churchie’s Head of Gifted Education Grant Smith. “We really value being part of the QMEA and the opportunities it brings for our students, particularly the clarity they can gain through talking to people in roles that they might aspire to,” he said.